Smallpox, or variola major, is a highly contagious disease that is caused by the variola virus. The name smallpox comes from the Latin word for spotted. A visual hallmark of smallpox is the raised bumps that appear on the victim's face and body. Smallpox is fatal in approximately 25% of cases. There is no cure for smallpox, and treatment is supportive. Prevention of the disease by the administration of smallpox vaccine is the most effective strategy to eliminate the spread of smallpox. Vaccination, conducted on a worldwide scale, was successful in effectively eliminating smallpox as a naturally occurring disease. The eradication of smallpox saw the end of routine vaccination programs. As of 2003, no American under the age of 30 routinely receives the vaccine. Even in older Americans, immunity has likely faded. After the bioterrorist anthrax attacks on U.S. citizens in late 2001, concern has heightened that smallpox will be used as a terrorist weapon on a population that is once again susceptible to infection. Beginning in January, 2003, health care workers at strategic hospitals and research centers across the United States received the smallpox vaccine in order to provide a population of immune responders in case of a smallpox out-break or mass exposure due to bioterrorism. Mass vaccination programs are again under study by researchers, and smallpox vaccines are scheduled to be available to all Americans on a voluntary basis by mid-2004. The only smallpox vaccine that is in use today—a preparation called Dryvax—is made from vaccinia, a poxvirus that is very similar to the smallpox virus. The reaction of the immune system to vaccinia confers protection to the smallpox virus. The vaccinia virus that is administered is alive and causes a mild infection, which is inconsequential in most people. However, in a small minority of people, the use of the live virus does carry a risk that the virus will spread from the site of injection, and that side effects will result. The side effects are typically minor (e.g., sore arm at the injection site, a fever, and generalized body aches). However, rare severe side effects are possible, which can even be life threatening. These include encephalitis (a swelling of the brain and spinal cord), gangrene, extreme eczema, and blindness. People whose immune systems are not functioning properly are especially at risk, as are those people who have had skin ailments such as eczema or atopic dermatitis. The fatality rate due to the vaccine is estimated to be one in eight million. Despite the risk, smallpox vaccine is worthwhile if exposure to smallpox is possible. A single injection of vaccinia vaccine preparation provides up to five years of immunity to smallpox. A subsequent injection extends this protection. Studies have demonstrated that up to 95% of vaccinated people are protected from smallpox infection. Protection results after just a few days. If exposure to smallpox is anticipated—such as in a military campaign— vaccination a short time before can be a wise precaution. Smallpox vaccine is injected using a two-pronged needle dipped into the vaccine solution, which then pricks the skin of an upper arm several times in a few seconds. The injection typically becomes sore, blisters and forms a scab. When the scab falls off, a distinctive scar is left. Currently, the stockpile of smallpox vaccine in the U.S. is about 15 million doses. The vaccine may be capable of being diluted 10 times without losing its protective potency. This would extend the coverage to 150 million people. As of December 2002, 155 million additional doses of smallpox vaccine are being delivered. The new vaccine is made from cow tissues that were grown in laboratory culture. This technique produces a more uniform vaccine preparation than the old method, where tissue was scraped from the lesions of infected cows. Other smallpox vaccines. The development of improved smallpox vaccines, and the refinement of existing vaccine preparations, has begun only recently. Research on improved vaccines largely ended when the demand for vaccinations ended in the 1970s. A form of smallpox vaccine called Modified vaccinia Ankara (MVA) was developed 40 years ago. The vaccinia virus used in this preparation cannot replicate in human cells, but still generates an immune response. While the vaccine appears to produce fewer side effects than the standard vaccinia vaccine, large scale tests have not yet been done. Another vaccinia strain that has been used to develop a smallpox vaccine is called LC16m8. In contrast to MVA, LC16m8 does replicate inside human cells. However, the virus lacks some of the usual surface proteins that may be important in the immune response. Genetic engineering is also playing a role in smallpox vaccine development. For example, a vaccinia strain has been engineered that does not form certain proteins unless the antibiotic tetracycline is present. The idea here is that the vaccine and the antibiotic would be taken simultaneously. In the event of an adverse vaccine reaction, use of the antibiotic would be stopped, which would stop the immune reactivity of the vaccinia virus. This approach is still in the laboratory stage. 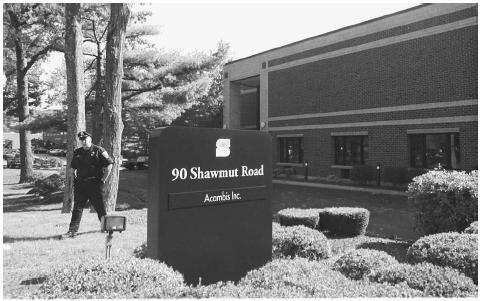 A Canton, Massachusetts, police officer, left, is seen outside the offices of Acambis Inc., a licensed producer of smallpox vaccine, in October 2001. The fear of bioterrorism attacks has spurred federal officials to ask the British-owned company to speed up production of the vaccine. Institute of Medicine. Assessment of Future Scientific Needs for Live Variola Virus. Washington, DC: National Academy Press, 1999. Henderson, D.A. "Smallpox: clinical and epidemiologic features." Emerging Infectious Diseases no. 5 (1999): 537–39. Rosenthal, S.R., M. Merchlinsky, C. Kleppinger, et al. "Developing New Smallpox Vaccines." Emerging Infectious Diseases no. 7 (2001): 920–26. Centers for Disease Control and Prevention. "Smallpox Factsheet: Vaccine Overview." Public Health Emergency Preparedness and Response. December 9, 2002. < http://www.bt.cdc.gov/agent/smallpox/vaccination/facts.asp >(31 December 2002).